Andrea's World Reviews: Win a VITAMIX 5200!!! Just in case you were living under a rock and missed my post last week announcing a super awesome contest, here are the details again. There are NO entries so far. That is so unbelievable. If you want a chance at this fabulous prize, get to work and enter before it's too late. 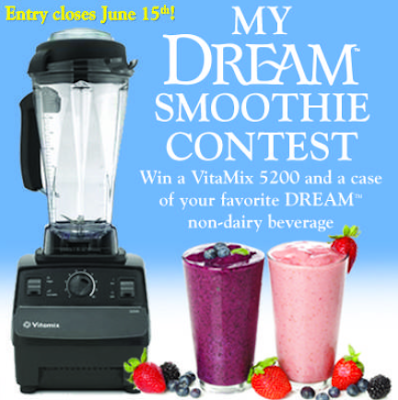 You could win a Vitamix 5200 Blender AND a Case of Dream Brand Shelf Stable Non Dairy Beverages. All you have to do is come up with a delicious smoothie recipe utilizing a Dream Brand product as one of the ingredients. Take a before picture showing all the ingredients(including a Dream product) and an after photo of the finished smoothie. Post the photos(or paste to one photo and post) publicly to Facebook, Twitter or Instagram. Post the link(s) to the photos as well as your first name & last initial, the title of your Smoothie, the ingredients(and quantities) used and the directions in a comment on this post. You can enter multiple times as long as each smoothie stars a different Dream product(and a different recipe). So one could have Rice Dream and Strawberries, etc. and one could be Coconut Dream and Bananas, etc. Post each recipe in a separate comment. Since the winner will be chosen based on quality instead of at random, the odds are very good, especially if you enter with more than one recipe. All you have to do is make a great smoothie. Basically it;s a win win. No matter what you get the fun and the deliciousness of making smoothies, plus the chance at 2 awesome prizes. The winner will be chosen from all blog entries (across the 4 participating blogs) collected by 12:00am June 15th. The Winner will be judged by the DREAM team on the grounds of photo use/quality, recipe creativity and DREAM product involvement. The DREAM team will announce the winner Monday, June 17th. Don't miss your chance to win this amazing prize. Somebody is going to win, why not you? You can't win if you don't enter. Place all ingredients in blender and pulse to desired consistency.